Disney World's Toy Story Land - Did It Meet Our Expectations? As many of you may have picked up on at this point, we aren't local (at least not at this point) Disney parks fans. However, we do have the rare blessing of being able to tour the parks multiple times throughout the year. At times that includes a few "last minute" trips that are a touch more unconventional than you may expect in order to cut costs and make the most of the time we have in the parks. In early June we decided to go to Disney and while we knew Toy Story Land was opening a short time later, it didn't entirely work out for us to be in Orlando for the opening of the highly anticipated land. Fast forward to about a month later and we decided to take a super last minute trip at the urging of friends (that are locals) to come down and check out the new expansion. It didn't take much convincing and we made a last minute (booked 2 or 3 weeks before we flew out) trip to the parks to explore the land and a few things we had missed on our early summer vacation. Inevitably that poses one big question and that question is "Did it live up to the hype?" Truthfully, I went into the Toy Story Land expansion with vastly high expectations. I am unashamedly a part of the "Toy Story Generation" and a part of that age range that really has never known a world without Toy Story in It. Toy Story is and was a film I've watched my entire life and being able to step into even a small portion of that "world" as a toy on this grand stage at Walt Disney World is something I had always wanted to see in the parks in some way, shape, or form. When Disney announced this expansion at D23 I instantly wanted to see the project completed and completed in a way that brought all those dreams to life in some way or another. Skip seen to today, having been there and seen the project completed in real life, I have to say it met and likely exceeded my expectations. I know this project has received a lot of bad press from so many different sites, but to me it's exactly what it was meant to be. Sure, it's not perfect, but at it's core it does everything it was designed to do. It's a place for families and it's a place that really puts a smile on your face. It's simply put "fun" in a way in nearly every regard. You can sit back and relax and be a kid again for a few minutes and enjoy the simplicity of the moment. If you're of that "Toy Story Generation" or have kids that you've watched grow up enjoying these films, you will undoubtedly see a piece of your childhood or their childhood in this land. As a family of four, we typically travel as a family even though we're all in different places at times and go to the parks with different goals in mind of what we want to get out of the vacation experience. My sister and I are of that generation of Toy Story fans but the land checked a box for our entire family and everyone we've talked to who's toured the land. That's the key to it all. It's not a place that only thrill seekers want to go see, or is only for kids, or that only adults can enjoy. It's a place where everyone can enjoy at least one part of the experience and often times for entirely different reasons. Wasn't that the point of the Disney theme parks from the very beginning? 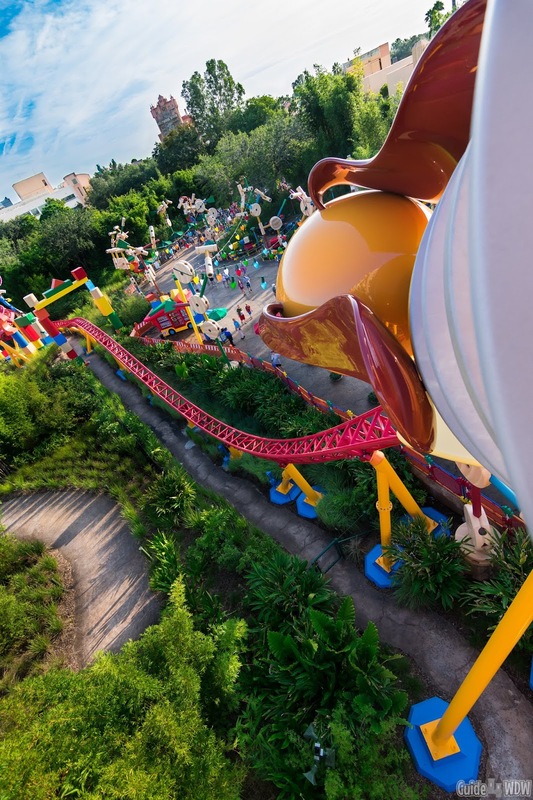 Walt wanted this place that families of all ages could enjoy and do things together in and in it's simplest of descriptions, that is what Toy Story Land created. I know that overview seems like a glowing press statement or something you'd see on a commercial somewhere but Disney hasn't asked me to do any of this. We weren't invited as "press" or "media" in this instance and I still whole heartedly stand behind the claim that this is and will be a place that checks so many boxes in favor of the guest and that excllent story telling experience the land develops. This attraction was certainly a priority of our trip. It's the one attraction everyone recommends you get a fastpass for and the one that hardly anyone can uncover a fastpass selection for. Thankfully we know the booking site fairly well and its ins and outs so we did manage to come across a pass for Slinky Dog Dash for the middle fo the afternoon. (If you are looking for fastpasses for this attraction, check out our tips for securing them here). Our goal going into the park was to ride the attraction at least twice or possibly even three times. Once at opening, once at dark, and once with our fastpass. Ironically we discovered rather fortunately that it's not all that difficult to ride the attraction multiple times in one day if you plan your day pretty effectively (see our How We Rode All 3 Toy Story Land Attractions in Under 45 Minutes!). I share that little bit of information for a few reasons. Honestly, first it's a shameless plug to another article, but second, I think it shows that we have at least a fair analysis of the attraction from a variety of perspectives and at different times of day. Slinky Dog Dash is one of my new favorite attractions. It makes you laugh in a way that very few attractions do and it's the perfect blend of thrill and simplicity so that nearly any guest can ride it. It's also a surprisingly lengthy ride compared to what you expect when looking at it. The entire attraction winds its way through nearly the entire land, and much of the attraction you can't even see without being in a ride vehicle. Slinky Dog Dash isn't going to be a mind blowing attraction for you like Flight of Passage likely was or will be when you get to ride it, but it is a ton of fun and is worth the wait if you aren't quite as lucky as we were in riding it during short wait times. Going into this attraction, it was honestly one that I expected to hate. I'm not a fan of spinning and I'm not a fan of scrambler-esque style attractions. The Tea Cups are certainly a "no-go" for me and I didnt think this would be much better of an alternative. I am thrilled to admit that I was wrong. This attraction did not bother me in the slightest and unless you're incredibly sensitive to spinning, you should be fine! The motion of this experience isn't as much of a spin as it is a slide around a corner. 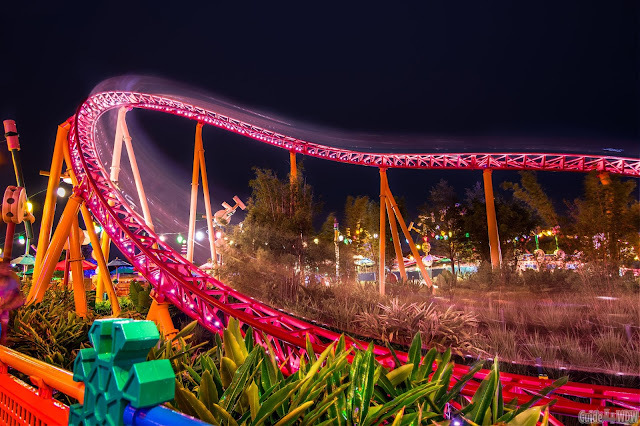 Again, just as I mentioned about Slinky Dog Dash, it just brings a smile to your face and makes you laugh. 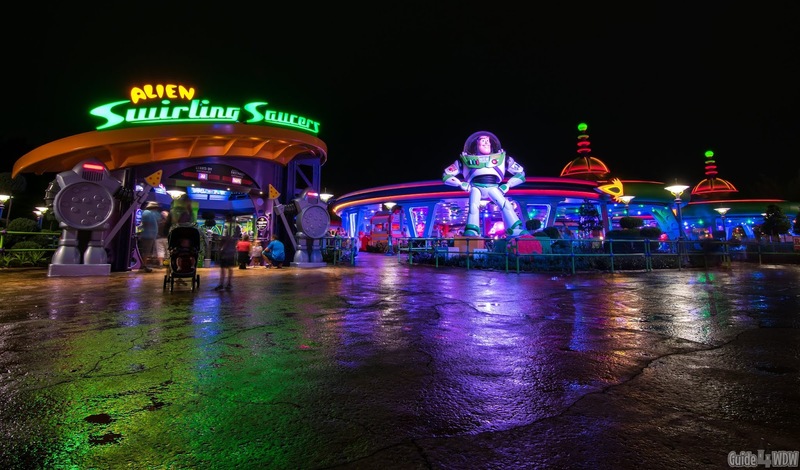 The music is a blend of techno mixed with some of the most iconic songs from the Toy Story films. It sounds strange when first described in writing, but when you're there it fits the attraction and adds another layer to the sensory puzzle. Combine all of those things with announcements by the Green Aliens before and after each ride, the colorful lighting, and sounds of it all happening at once and it's an attraction that is a ton of fun. If I had to share one tip for this attraction it would be to save it until after you've ridden Slinky Dog Dash in the morning. The line doesn't build very quickly and you will still be facing a short wait even after riding the headline attraction. We didn't quite get to try as much of the menu here as we originally intended to but we did grab a snack at Woody's Lunch Box mid-morning and it exceeded expectations. The line was short, the staff was pleasant, and what we ordered was immediately ready. One of the main concerns I've heard about this dining location is that the seating is all outdoors. We didn't have any problems with that due to very large fans place around the edge of the seating area. I'm not entirely sure if that's a new addition but it's a great touch either way. We didn't really have any issues with the heat and this was in late July on a 95+ degree day. What I will mention here though is that if you do have to wait in the standby line for Slinky Dog Dash, don't do it in the middle of the afternoon. The queue is not all covered and there is very little breeze. It could be a very warm wait in the peak afternoon heat. In regard to the menu items we tried, I have to say we only got to taste the Raspberry Lunch Box Tart. It was the main thing we had anticipated trying since the menu was originally announced and it actually did meet our expectations. As many have said before, it's very similar to a pop tart you'd find at local grocery store, but instead of being rock hard this one is somewhat dense much like a pastry. It's almost got like a pie crust texture to it and the icing is soft but just crispy enough to add a little texture. The filling isn't excessive and is quite a bit better than I expected it to be. If you're in the land, I highly recommend giving these a try. Toy Story Mania is still that classic attract we all have grown to love and enjoy over the last few years, and the new queue and entrance adds back in a piece of the original character of the attraction that has been missing during the construction and enhancements. Mr. Potato head is back and better than ever, and the queue itself seems to fit it's new surroundings far better than it did in the past. Call me a little nostalgic, but I'll miss Pixar Place and the giant marquee Pixar sign that was oh so reminiscent of the studio out in California. On the bright side of all of the changes, Toy Story Mania's wait times have dropped exponentially early in the day and late at night. We rode it three times in one day and never waited over 15 minutes! Is it Worth a Trip Down Before Galaxies Edge Debuts? I know this is a question so many are looking to get an answer to before they book their vacation. My simplest of answers to that question is "yes." Why? Well here's the thing. 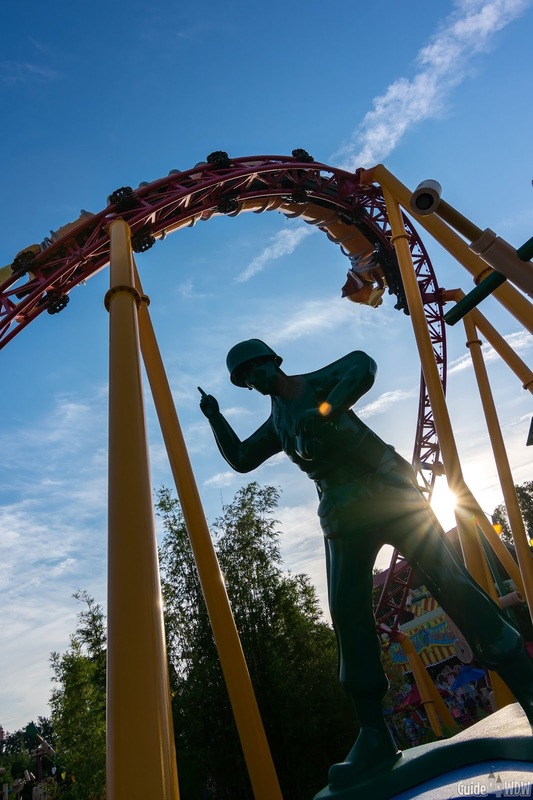 Toy Story Land started out with incredibly long wait times but those wait times shrank considerably in the weeks following the debut. Shorter wait times are always a bonus. If you wait until Galaxy's Edge opens you can almost guarantee wait times will take a jump again. Obviously huge crowds are going to arrive for it's debut and much like Pandora, Galaxy's Edge is going to be something everyone will want to see. As the crowds roll in for that, you're going to have a secondary group of guests that will see the wait times in Galaxy's Edge and walk the short distance over to Toy Story Land and ride that instead. Unfortunately, more attractions rarely means the crowds get "spread out." New attractions may pull crowds to different parks more so than others, but within the same park, when one thing opens typically you'll see wait times jump up in length across the entire lineup of attractions. With all of that being said, I recommend seeing it now if it is feasible for your situation and then returning to see Galaxy's Edge when it debuts if at all possible. When that land opens it will change Hollywood Studios and potentially make it a multi-day park. It will be near impossible to see and do everything in one day. Much like Animal Kingdom, this will go from a half day park to easily a one to two day part of your vacation if you want to see and do most of the shows and attractions. Part of our goal for this trip was Toy Story Land. Another goal was to revisit Pandora and take some time to enjoy the details of that experience. That just goes to show that these new lands aren't something you can go to once and say "been there done that." Imagineering has packed details into this land and in my opinion it lives up to every expectation I had for the project. Sure, it's not Pandora in scale but it's not supposed to be! That's what I think so much of the media giving this land poor reviews and hateful comments fails to realize. It's a place to go and just have fun. It's not designed to be this massive land that takes you to a different world like Pandora but rather a land that is literally designed to be family friendly and fun. A friend of mine said it best, it's almost as if Imagineering brought their kids to work, handed them some toys, and stepped back to see what would happen. The land we have as a result looks just like that situation unfolded in real life. It is, in it's most simplest of forms, that larger than life creation you were imagining as a kid when you were sitting around playing with your toys and building an elaborate story in your head. That's what this land is all about and one of the main reasons I see it as a huge success overall!